Nyalox brushes are constructed of abrasive impregnated nylon filaments in three color-coded grit ranges. Available as wheel, cup, end and flap brushes. These products can outlast steel or brass wire brushes 10 to 1, and can perform more operations as well. Nyalox brushes can both deburr, radius and finish surfaces at once, eliminating steps and saving time and money. Stock brushes are available for of-hand, or bench grinder applications, and special orders can be placed for robotic applications on large parts. Now there's a new way for commercial and industrial users to clean and polish a vareity of materials without gouging. 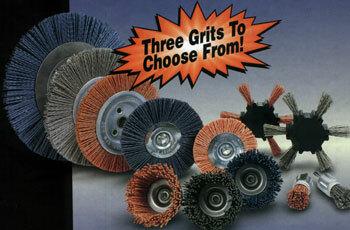 The nylon bristles are thoroughly impregnated with abrasive grit, color-coded for easy selection. Nyalox removes old paint, rust, corrosion, oxidation, weld scale and burrs from metals. Wood products can be structured, denipped and finished. Clean and sand unfinished and rough surfaces in one application. Nyalox lasts up to ten times longer than metal wire brushes, will not shed its bristles and will not puncture the skin. Since the abrasive grain is throughout the filiment, the finish remains constant as the brush wears down. Since the tips of the bristles do most of the work (lighter pressure is required than with wire brushes)fresh abrasive grain is constantly exposed. Nyalox brushes are available in 3"and 4" wheels, 2.5" cup, 3/4" end and 4" flap, all mandrel mounted. General purpose wheels come in 6" and 8" diameters with 1/4" width and copper 3/4" center for use with bushings to meet other arbor hole sizes. The ability of Nyalox to surface finish, deburr and radius in one pass will save time and money. Custom-made sizes are available to finish any sized part, up to 40'extrusions with robotic applications.